Greetings from the land of the great blue sky! Over the next few weeks I’ll have a series of posts from here in Mongolia’s capital city of Ulaanbaatar, and its environs. Food shopping here is very interesting, and in recent years markets have drastically expanded offerings, to the point where most basic needs are covered for diverse tastes. Restaurant offerings are also growing in variety. To put it bluntly, there is a lot of great food to be had. At home in Philly I get a thrill out of locating obscure Asian food items. 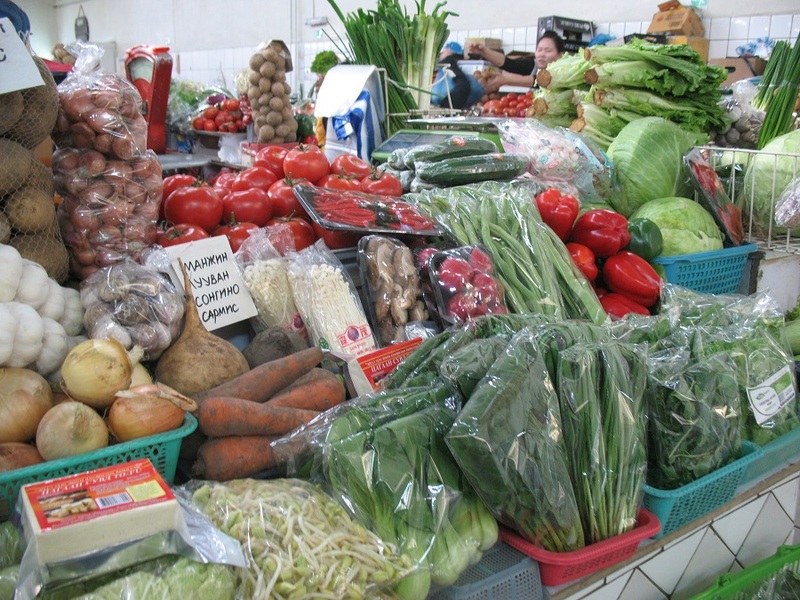 That thrill is taken to a new level in a place like Mongolia, where even fresh vegetables can be scarce. The title of this post may seem a bit odd to some, as Mongolia is indeed in Asia. My objective here is to highlight some relatively recent imports to Mongolia from China, Japan, Korea, and beyond. The single most fascinating place for food items (that I’ve found so far anyway) is Mercury Market, not far from the circus building. This is a bazaar of sorts, with kiosks and shops tucked away in the building’s rooms. The location of this market is within a mash-up of buildings, together with a decent-sized Miniy Market chain grocery store as well as the Passage Market collection of clothing shops. 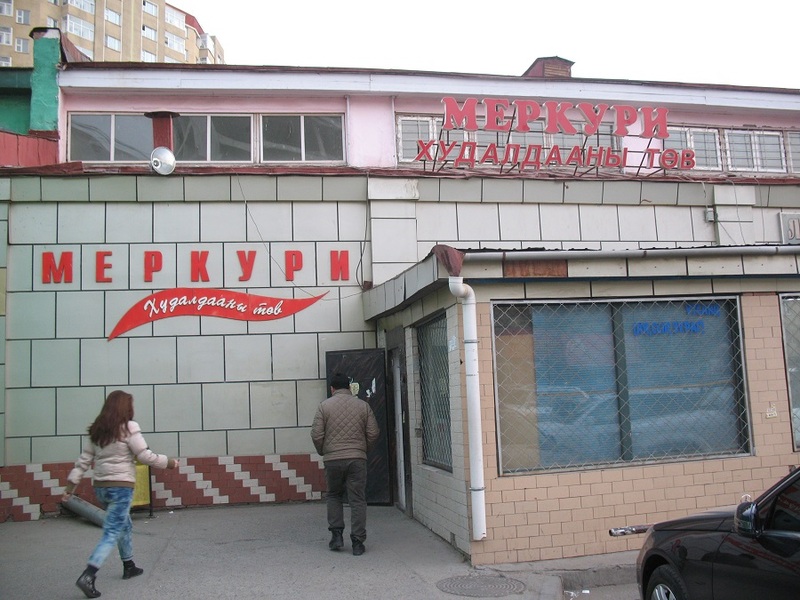 The first half of the building consists of cheese, bread, fruit, canned goods sellers. 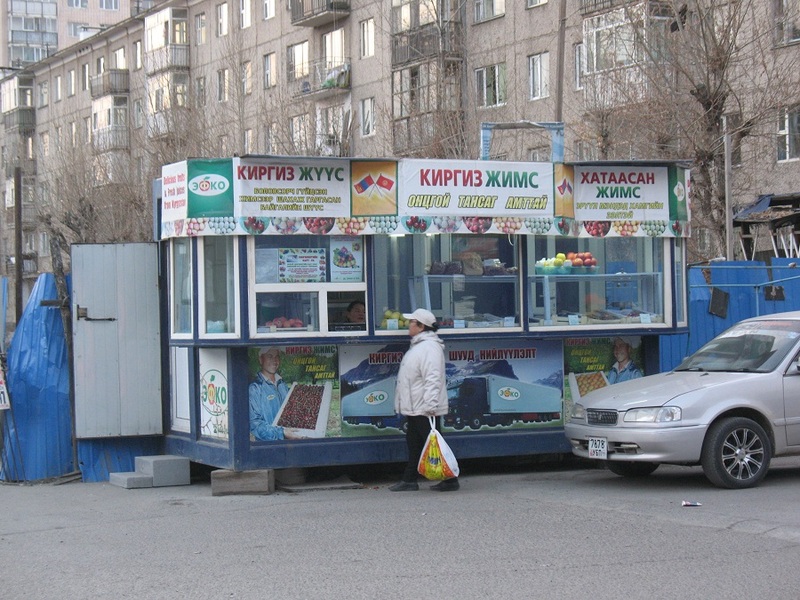 Canned goods are largely coming from Russia and adjacent countries. European-style cheeses and sausages are also in abundance. There is also flat bread that resembles Uzbek non. Among the notable fruits, I found long Hami melons. We’ve been eating the cheeses with breakfasts in the morning and they are quite good. 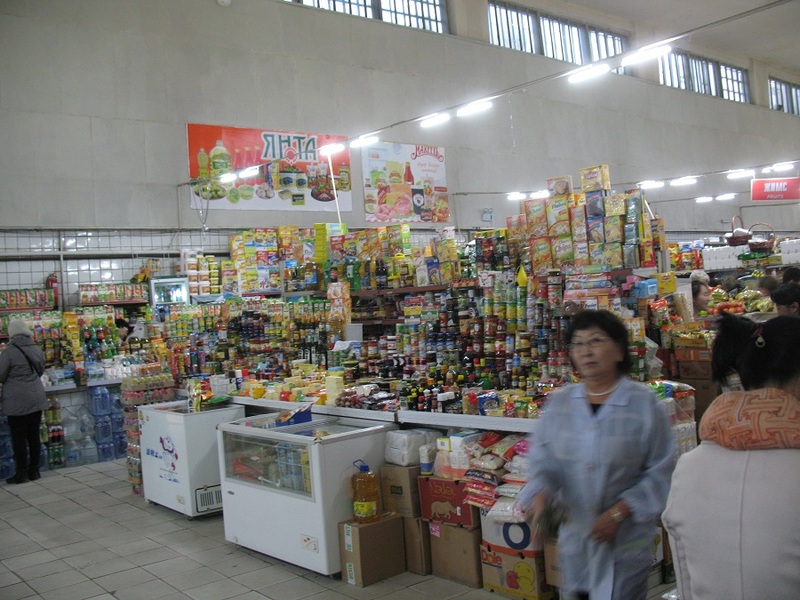 “Asia Market”, one of the several small rooms inside Mercury Market that have specialty items mostly from Korea and Japan. Note the use of the term above “Asia Market”. See, I wasn’t so far off here. Does this imply that Mongolian food items are “normal”, and Asian food is something else? If you go through one of the corner doors, you end up in the fresh produce and meat section. I was quite surprised with the produce available. Of note: cilantro, shanghai choi, mint, basil, dill, garlic chives, leeks, cabbages, lettuces, chile peppers, spinach, soybean sprouts, long beans, tofu. 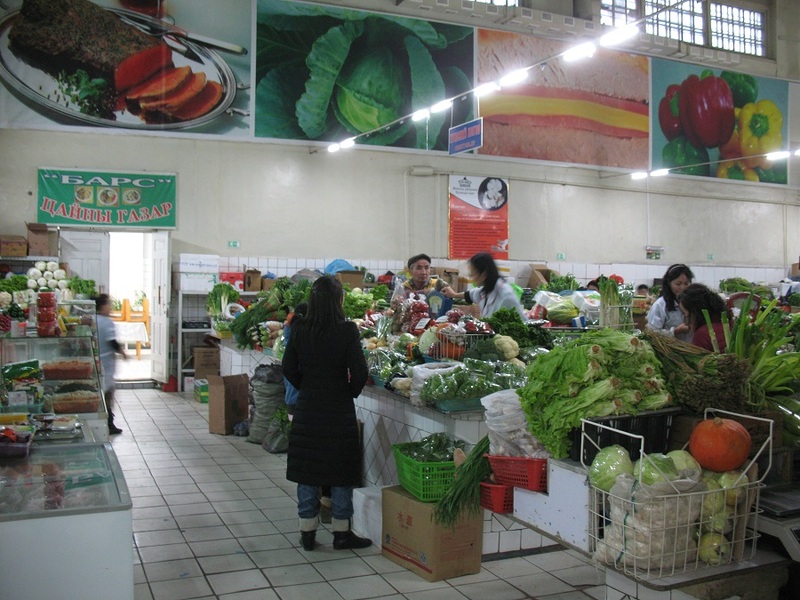 On the left of the picture above, you can see a kimchi counter where a variety of kimchi are for sale in bulk. On the other side of the produce market there is another couple of Asian Market shops, selling mostly non-perishables and dried noodles. 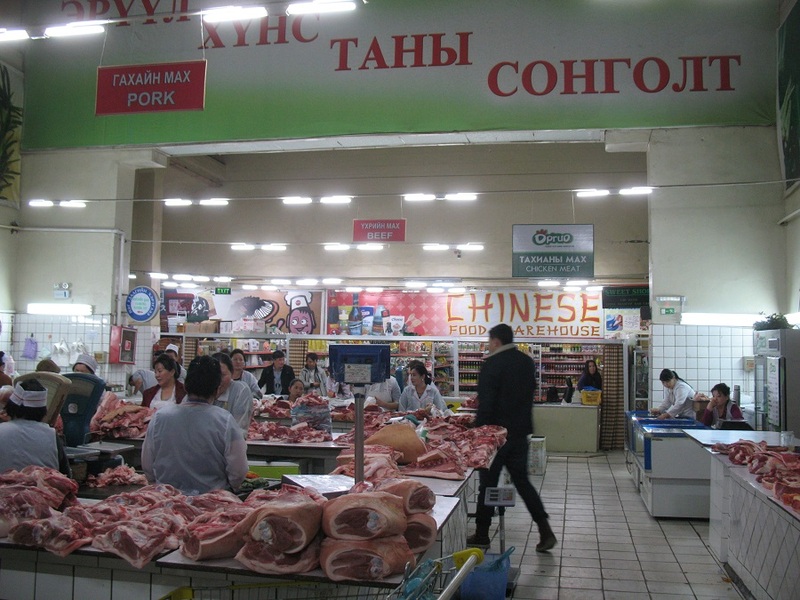 Mercury Market’s meat section and the “Chinese food warehouse” inside Mercury Market. Korean and Chinese items. Just in between Mercury Market and the huge circus building you can find the “Chinese food store”. This is the best selection that I’ve seen so far for Chinese products. All spices for stews and meat braising can be found here, along with Sichuan chiles and huajiao. 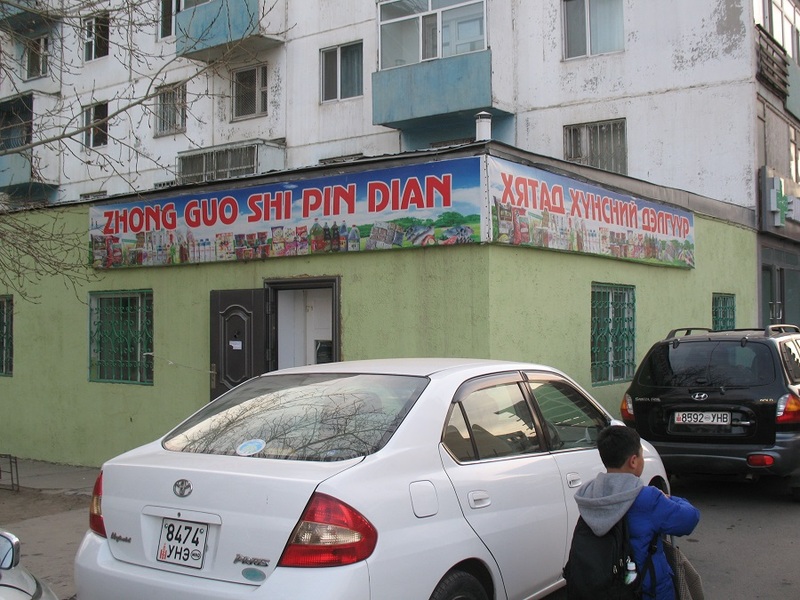 I also found Xinjiang dried figs here. 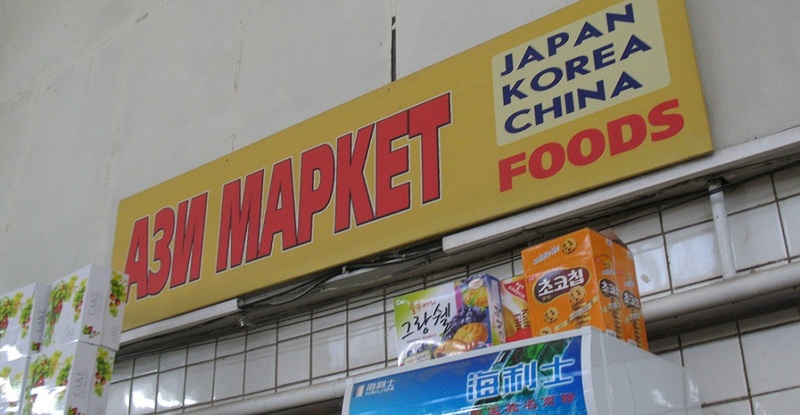 Many basic Korean food items are also available at large grocery stores throughout UB. For example, kimchi and gochujang can be found at Miniy Market, or the Nomyn grocery store chain (i.e. on the ground floor of the State Department Store). Korean food is among the food staples of Ulaanbaatar. That will likely be the subject of a future post. 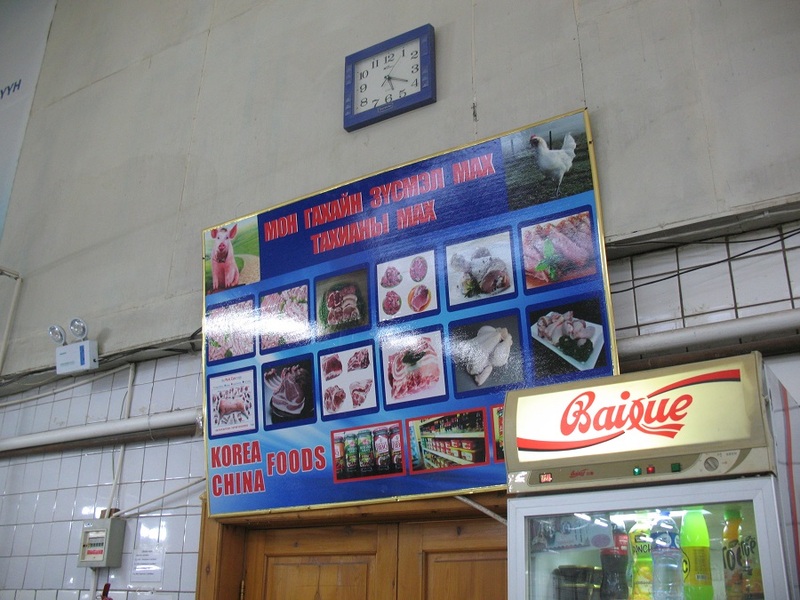 This entry was posted in - Featured Food Discoveries, - Featured Markets, - Guides, Central Asia/Uyghur food, Chinese food, Mongolian food and tagged Asian grocery, Chinese food, Монгол, 蒙古国, Japanese, Korean, Mercury Market, Mongolia, хүнсний дэлгүүр, Ulaanbaatar, 中国食品店, 乌兰巴托. Bookmark the permalink.